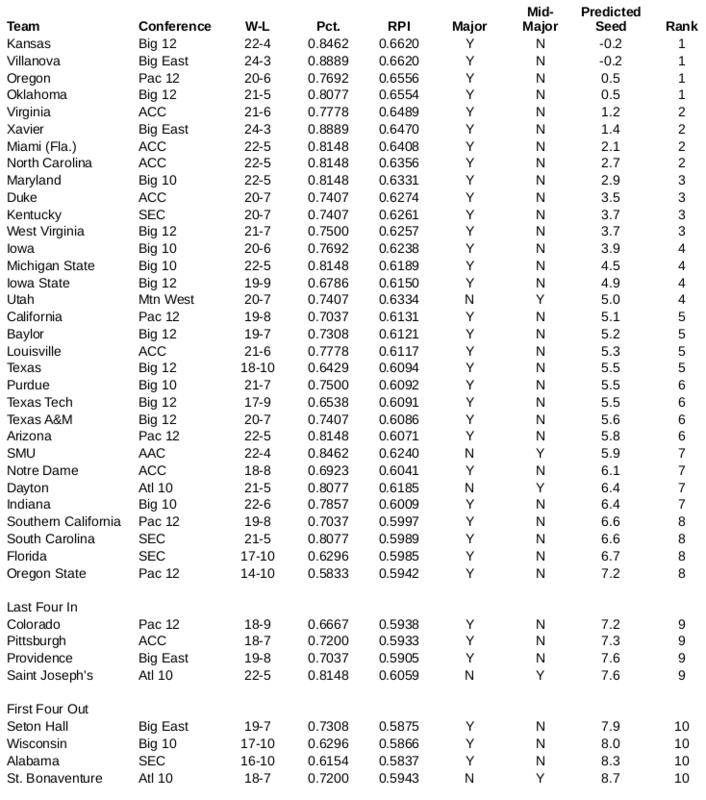 Last year I published a simple model of NCAA Men’s Tournament seedings based on RPI and conference membership. 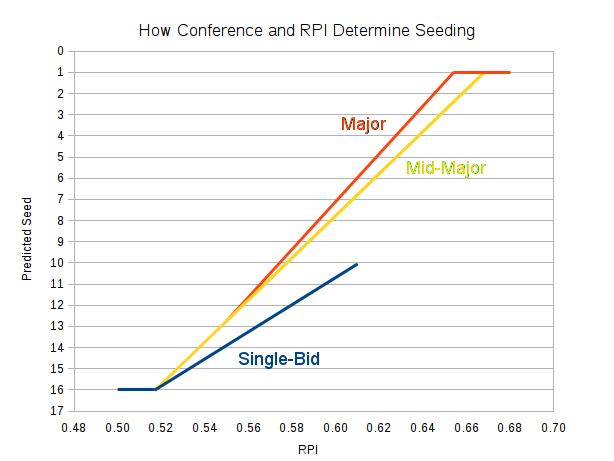 To recap, higher RPI teams received better seedings, and teams representing major and “mid-major” conferences got better seeds than teams from the other conferences even if they had identical RPI scores. In principle we should see no differences between conferences once RPI is taken into account because the measure relies heavily of a team’s strength of schedule. Teams in stronger conferences should have higher RPI scores because they face a more difficult schedule. A team with an RPI of 0.600 from a “single-bid” conference like the Colonial or the Ivy League is predicted to be seeded tenth or eleventh, while schools with identical RPI figures from the mid-major and major conferences would receive a six or a seven seed. The advantage for both those conferences over single-bid schools grows as RPI increases, as does the advantage for major-conference teams over mid-majors. We can use the model I estimated that underpins this chart to estimate how teams will be seeded in 2016 based on their current RPI scores. Using RPI figures from CBS Sports through Sunday, February 21st, gives us the following predictions for the 36 teams that will make up the at-large field in this year’s Tournament: Both Louisville and SMU are ineligible for Tournament play in 2016, so Seton Hall and Wisconsin have a chance to slip in at the bottom of the rankings.